Reserve - Please call for same day reservations or if you donâ€™t see your ideal tour date or time! 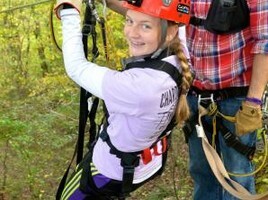 Our 2 1/2 to 3 hour-long, zip line canopy tour leads adventurers through the tree tops by means of 7 zip lines, 2 sky bridges, and 2 rappels connected to platforms suspended in the tree tops. Whether you are a nature lover, adventurist, or an adrenaline junkie you will not want to miss out on Tree Frog Canopy Tours! Experience the thrill of our WHOLE course while enjoying the beauty of the sun rising or setting (your choice!) over the gorgeous Mohican River Valley. Please keep in mind that you must have at least 4 participants for our Sunrise Tours. By request only, must have at least 4 participants in your group. Unlike other zip lines, our Night Rider Club includes our ENTIRE course! So get your night vision ready and experience the Forest from a new perspective! IN COMPLETE DARKNESS!! Only the glow from your glow sticks to light the way. Come on...WE DARE YOU!